· Quiet time: 11:00 pm – 8:00 am. This is strictly enforced for the enjoyment of all guests. No loud music at any time. Please respect your neighbors. · Pets: Pets that are quiet, under control, and on a leash at all times are welcome. Pets are not allowed on the beach or playgrounds. Please clean up after your pet. · Garbage: Please use dumpsters by boat trailer storage for normal garbage. Cardboard, newspapers, or recyclables go into separate dumpsters/containers. Please separate your glass, plastic bottles, and beverage cans, and deposit them into the recycling bins marked accordingly, located behind the boathouse. · Campfires: All fires must be contained within fire pits only and must be extinguished before retiring for the night. Absolutely no garbage is to be burned or left in the fire pits. Children under 12 must be accompanied by an adult at the campfire. · Boats & Docking: All boats are to be docked only in their assigned slips. · Security: Do not leave coolers or valuables out overnight. Lock vehicles at all times. Do not leave valuables in sight. 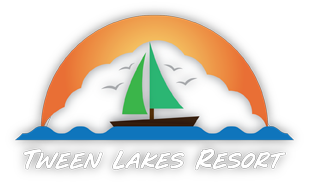 The Resort is not responsible for lost, stolen, or damaged items. · Illegal Substances: No illegal substances are permitted on Resort property. Any illegal substances found or being used on the property will be cause for immediate termination of stay and removal of all personal property. · Property Damage: Any guest or visitor who willfully or negligently defaces, damages, or destroys property or equipment belonging to the Resort shall be liable for the full replacement value thereof. · Supervision: All facilities offered or supplied by the Resort are unsupervised. Parents are responsible for their children’s actions and activities before and after hours. Behavior outside of the rules and guidelines may be cause for immediate termination of stay. · Vehicles: Parking spaces are limited, and therefore we ask that each site only have one vehicle parked within the Resort. · Please use our facilities at your own risk. The Resort is not responsible for any accidents, mishaps, or injuries during your stay. These rules and guidelines have been set forth to help assist in making your stay as pleasant as possible. If you require any assistance, please contact Resort Caretakers or staff.